The Device is Unlocked would work for Local and International GSM Carriers. UNLOCKED STATUS OF DEVICE APN Settings: The Device is Unlocked and may ask you for APN Settings for optimum performance for 4G LTE and MMS. Nokia Lumia 530 - 4GB white. Windows phone, barely used. Works. 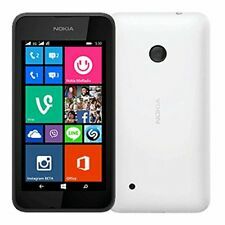 Nokia Lumia 530 - 4GB - White (Worldwide GSM Unlocked) Smartphone. New Nokia Lumia 530 White Unlocked. Unlocked Phone for use with any GSM Sim Card Worldwide! operate on either 850MHz, 1900MHZ or both depends on the region in US. CRICKET NOKIA LUMIA 530. MINOR AND MAJOR scratches and scuffs will be visible form afar. The LCD may also have a scratches and scuffs, but it will not affect its visibility. FAIR CONDITION (3/5). All phones are clear ESN unless otherwise specified. Trending at $12.29eBay determines this price through a machine learned model of the product's sale prices within the last 90 days. Nokia Lumia 530. Model: Lumia 530. Color: White. We work hard to provide the best product for you. Tu Satisfaccion es lo mas importante para nosotros. Estamos aqui para servirte. GPU: Adreno 302. CPU: Quad-core 1.2 GHz Cortex-A7. It has a Clean ESN. Tested on 21 Point Check System by trained professionals. You would need to Hard Reset the Device to make sure all the Data is erased. Screen: Light or Very Slight Signs of Use / Scratches Present. Pre-owned Nokia Lumia 530 Windows phone for TMobile Network. Small signs of wear, but perfect working condition. Original packaging included. Clear ESN. Nokia Lumia 530 smartphone was launched in July 2014. Model : LUMIA 530. ===NO ACCESSORIES (CABLE, BATTERIES, LENS)===. Working well. Specifications are subject to change without notice. While every attempt has been made by RepoGuys in the production of these specifications, possible errors or omissions may still occur. This phone is 100% unlocked will work with any GSM networks. One Lumia 530 Manufacturer refurbished Phone. GSM Status GSM / HSPA. GSM 850 / 900 / 1800 / 1900. - MP3/WAV/eAAC /WMA player. - MP4/H.264/WMV player.